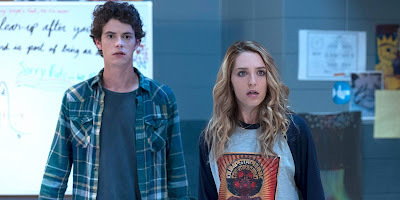 Movie: "Happy Death Day 2U"
Tree Gelbman learns what was behind her strange time-looping phenomenon, which sends her back into a loop she thought she had escaped. In the immortal words of the great Tupac Shakur, "why am I dying to live if I'm just living to die?" These words have never applied better to anyone more than Tree Gelbman. "Happy Death Day 2U," like the first film, is directed by Christopher Landon, who also takes over the writing duties this time around. As the story begins, Carter's (Israel Broussard) roommate Ryan (Phi Vu) seems to be experiencing the same phenomenon that inflicted Tree (Jessica Rothe) on her birthday. It turns out, it's because of a time-bending device that Ryan and a couple other students created for their thesis project. As Ryan, Tree, Carter and Ryan's friends Samar (Suraj Shamar) and Dre (Sarah Yarkin) try to figure out what happened, they inadvertently send Tree back to the beginning of her birthday where she is destined to die over and over again. Though things seem to be the same at first, it may turn out that this day isn't exactly as she remembered it. Much like Tree's experience in the first "Happy Death Day," "Happy Death Day 2U" is very familiar, but ultimately very different. This time around, Christopher Landon leans heavier into the comedic aspects of the story. Where "Happy Death Day" was a slasher mystery with darkly comedic elements, "Happy Death Day 2U" supplements its lack of horror with a full-on self-aware comedy story and only mild gore here and there. Most of the comedy could be called dark slapstick in that it is based on the ridiculous ways Tree kills herself. One death even breaks the fourth wall, which some will hate but we enjoyed quite a bit. The best part about this sequel is the acting. Jessica Rothe is still pitch-perfect as Tree and hasn't missed a beat since the original (we have decided that we will forgive her for her part in "Forever My Girl"). Rothe has an innate ability to bring tons of laughs with her snide, often sarcastic tone, and she has excellent facial expressions and body language to go along with her awkwardness, discomfort, annoyance, and irritation. Phi Vu is also hilarious as Ryan, a science-minded genius who literally discovered the secret to time travel. "Happy Death Day 2U" isn't the kind of film that takes itself seriously. There are a lot of holes in its plot because of its new and improved sci-fi premise, and some of the things that happen don't completely make sense. At one point, we got strong vibes that this could have been the next installment in the "Cloverfield" series. Don't worry, it isn't. The more we thought about it, the more the story crumbled under its own weight. If you can look past its holes and its inherent balls-to-the-wall goofiness, you will most likely find some enjoyment watching this sequel. Chances are, if you liked the original "Happy Death Day," you will like "Happy Death Day 2U," unless you watched the first one for its jump scares and horror elements, because like we said, though there are some kills, this installment is much more dialed back with the gore. These movies are sort of fun, and everyone in the cast looks like they are having a blast making it. We'd much rather watch these movies than most of the other crappy PG-13 horror flicks that get released annually. It's not a perfect sequel, but it provided us with a decent viewing experience.